Secretary-General António Guterres delivers remarks at the opening of the 2018 Boao Forum For Asia in Southern China’s Hainan Province. 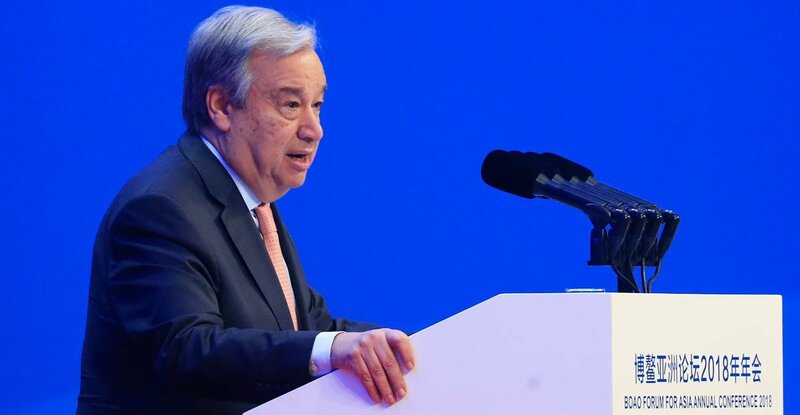 “I am deeply convinced that globalization is irreversible,” UN Secretary-General António Guterres told an Asian forum that brought political, business and civil society leaders together in the southern Chinese town of Boao. “Our destination must be a fair globalization that leaves no one behind as a pathway to peace and sustainable development,” Mr. Guterres told the annual Boao Forum for Asia. Mr. Guterres issued his plea as the specter looms of new trade disputes, with the United States planning to impose new tariffs on certain goods from China and other countries. The Secretary-General also made an urgent call for the world to address the escalating threat of climate change, which he said is going to intensify other global problems such as poverty, humanitarian crises and conflict. The Paris Agreement, adopted by world leaders in 2015, set a goal of keeping the global temperature rise to below 2 degrees. “But, let’s be clear: climate change is still moving faster than we are,” Mr. Guterres said, calling on world leaders to act to “bend the emissions curve.” He commended China’s global leadership on the issue, citing its ambitious targets on renewable energy. The United Nations, Mr. Guterres told the forum, has laid out a path to a more prosperous, equitable and environmentally sustainable world with its 2030 Agenda for Sustainable Development. “With its 17 Sustainable Development Goals, the 2030 Agenda is our blueprint for peace, prosperity and partnership for people and the planet,” he said.